The new “Ecuador” are refined and luxurious elevator sneakers finely handcrafted in Italy. 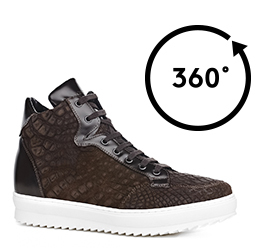 The upper is made of noble suede crocodile leather, with details in dark brown patent leather. The soft inner lining is made of goatskin. The insole in genuine Italian leather. The latest generation white outsole is super light rubber. The height increaser of the Ecuador can be chosen between 2.4, 2.7, 3.1 and 4 inches. Handmade in Italy, the exclusive Ecuador elevator sneakers thanks to their comfort and elegance are ideal for the autumn and winter cold days and also for most social events. The GuidoMaggi craftsmen team allows several possibilities for customization. Extremely luxurious and able to satisfy your height and style needs.